SuperSeal Matte can be used for Concrete Brick Pavers, Stamped Concrete, Stamped Cement, Decorative Cement, Bricks, Acid Stained Cement, Concrete Stains, and Exposed Aggregate. 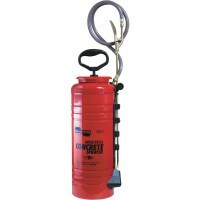 SuperSeal Matte can be sprayed on with the Chapin 1949 Concrete Sprayer or applied with a 1/2" roller cover. You cannot use a plastic "inexpensive" sprayer. SuperSeal Matte will help sand erosion reducing the amount of weeds. One coat will result in a satin sheen depending on porosity of brick. What percentage of solids does this have? I have Cambridge Pavers on my driveway in long island, NY. They were installed about 6 months ago. 1) Which finished will hold up the best? 2) Should I use Solvent or water base? 3) How many coats of are required? 4) Will the sealant come off after heavy cars are parked on the driveway? I have a Chicago brick deck and would like to seal it with a dull look- what product do you recommend and what prep is needed to be done before application.. I would like it to last as long as possible- we live on the gulf coast near New Orleans- thank you for your help! 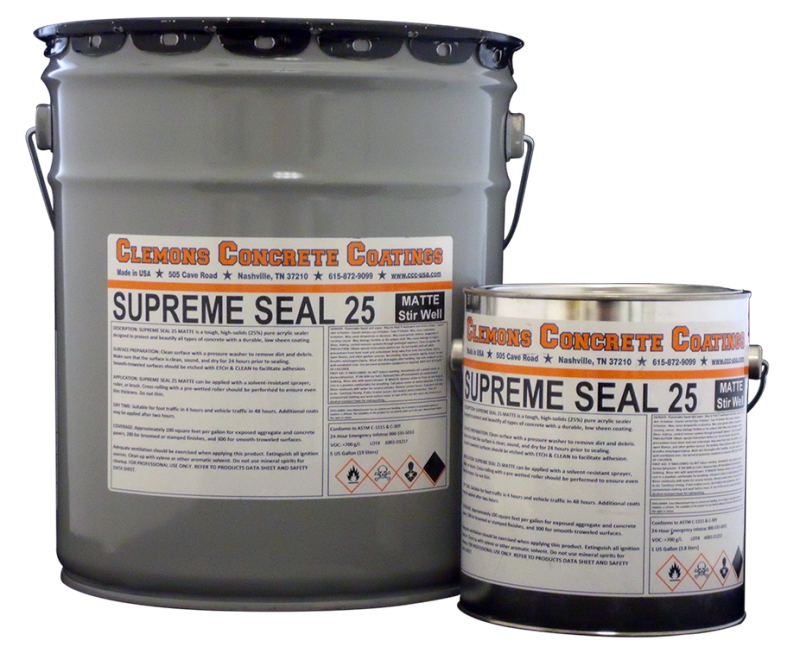 Also do your assortment of products all derive from the super sealer 25 product? Just clean off any dirt, etc and reapply. No need to strip. We are applying ss25 matte. After 2 years, do we need to strip and reapply or is it possible to recoat over existing? Thank you! As long as the surface is porous, your removed the old sealer and it is not discolored from the old coating, then you will be okay to seal with a solvent. Previous re-coating of my stamped concrete patio was a water-based sealer. I've stripped that old sealer off (at least it appears that way). Is it safe to apply solvent-based sealer? No it cannot be applied to ceramic or porcelain. Can this product be applied to ceramic or porcelain? Can non-skid additive be added? Not on clay bricks as it will not dry evenly. Concrete brick pavers are good. I would just leave it alone and hopefully the shiny spots dull some. It might have just that those bricks were less porous, resulting in more shine. So the only way to possibly resolve the shiny areas on the bricks would be to strip the sealer off and start over, or possibly wait for the shin to diminish over time due to wear? Thought it was strange since it is shiny over a few bricks here and there throughout the deck, and not centralized in a specific area of the deck. The Matte has an additive that lowers the shine. If it is not mixed well prior to applying you could get dull and shiny areas. You cannot "spray" something on to make it even or duller in the shiny area. In addition the Matte does have some shine but it should be even if it is mixed well. I only shook up the 5 gallon bucket for about a minute to mix the sealer before putting it in the sprayer. Did you mix thoroughly first? I applied superseal matte to my brick deck with a Chapin HD sprayer after the bricks were cleaned, prepped and dried. The bricks took the sealer well, but I noticed that in some areas the bricks are glossy rather than just wet. I don't think this is from over spraying or overlapping near the edges since it is throughout the deck. Is there anything that I can spray on the bricks to get the finish to look consistent wet and not glossy on some bricks? It will overall give a wet look to the stamped patio but it cannot "fix" any old sealer that has discolored by turning white or yellow in color. The SS Matte does have some shine. The SB-6000 has no shine. Trying to get a sealer that enhances our paver's natural color but we dont want any type of shine. This one says Matte but I see in the comments a Satin shine. Which one of these 2 will be less likely to give me shine? Thanks. 2. Best to apply with a roller. 1.) How well does this product hold under cold weather? 2.) Can it be applied with a brush or mop? Looking at the description above and some of the replies above, it is unclear if the finish is actually matte or satin. In the description it says "One coat will result in a satin sheen depending on porosity of brick.". So, soes that mean you need two coats to get a matte finish? Is one or two coats required to seal cement pavers? I does not peel but rather just fades evenly. It darkens the color and leaves a satin shine." So is it a satin finish or a matte finish? Please clarify. Ruby, you would need to strip it off and start over. Putting the SuperSeal Matte on top my dull it some but probably not enough. My newly poured colored concrete (color in the cement) was sealed the next day with a high gloss sealer. How do I get the high gloss off and give the driveway a matte finish? 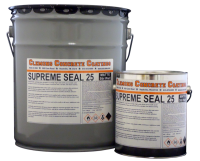 Can the Superseal Matte be applied to swimming pool pavers. Using an acrylic sealer such as the SuperSeal Matte should work well. We sell a lot of this sealer to the AX area. I have concrete covered with an acrylic coating to simulate flagstone. Can SuperSeal Matte be used to seal this type of surface? Also, I live in AZ and need a product with strong UV protection. Will SuperSeal Matt hold up well in this kind of environment?